1.A: the act or process of selling or purchasing in a market. B: the process or technique of promoting, selling and distributing a product or service. 2. an aggregate of functions involved in moving goods from producer to consumer. For my purposes, 1B is the most appropriate definition. Consider this, then, more than just a proposed slogan for the gym run by my new friends, Jacob and Sarah Garvin. Perhaps it’s also a mini audition for a marketing job. The Garvins opened Warrior Crossfit Muscatine last year at 211 E. Second St. And if they’re looking for a slogan, they might want to try: Warrior Crossfit, where the women are all stronger than Steinbach. Well, that might be an overstatement — only because I’ve only been there three times and haven’t had a chance to work out with everyone else. Today, I completed my first full Crossfit workout and I can safely say Ashley Schmieg is stronger than me. She and I worked together through what Crossfitters call The Seven. It is named in honor of seven CIA officers who were killed by a suicide bomber in southeastern Afghanistan on Dec. 30, 2009. The workout consists of seven rounds done for time. Each round consisted of seven handstand push-ups, thrusters, knees to elbows, dead lifts, burpees and kettle-bell swings. Ashley not only finished a full minute before me, she didn’t have to do modified versions of the handstand push-ups and knees to elbows like I did. 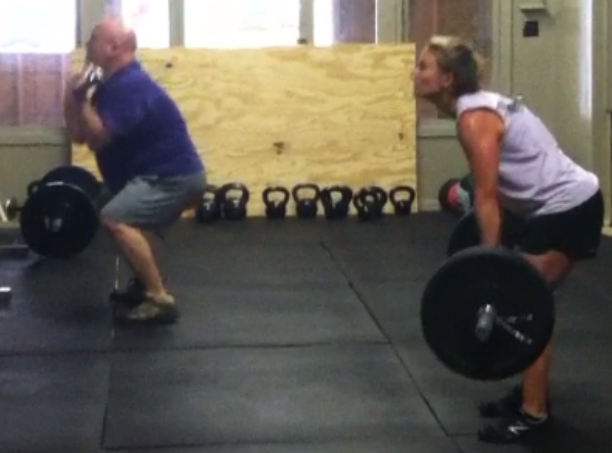 And she lifted more weights than I did for both the thrusters and the dead lifts. Oh, and she did all of this after having run in the Hayes Hustle 5K earlier in the morning with her son. It was pretty obvious which one of us is the real athlete. For the record, I finished in 30 minutes and 13 seconds. For the dead lifts, I lifted 95 pounds. For the thrusters, I just used a 45-pound barbell. I also used a 30-pound kettle bell. I did modified push ups by kneeling on a wooden box, dropping my head and putting my hands on the floor and then pushing up. But at least I finished and Jacob promises I’ll someday be doing handstand push ups. I’m not so sure. Depending upon whom you believe, the ancient Mayans predicted the world would end on Dec. 21, 2012. For what it’s worth, if that’s when the world really ends, I figure it also will be the day I nail a handstand push up. What’s Important is that you finished! And it didn’t kill you:) Nobody becomes an athlete overnight. Progress is slow but steady, but it’s consistent. You might be able to crawl out of bed in the morning 🙂 Then again, maybe not. Stay with it Chris! Thanks, Mike amd Val. I’m getting used to being sore all night. It makes every movement interesting. Hey Chris. Nice meeting you at Crossfit. You did an awsome job! Keep up the good work. Finishing those workouts, especially the hero workouts, are a real sense of accomplishment. What a great feeling going out the door. 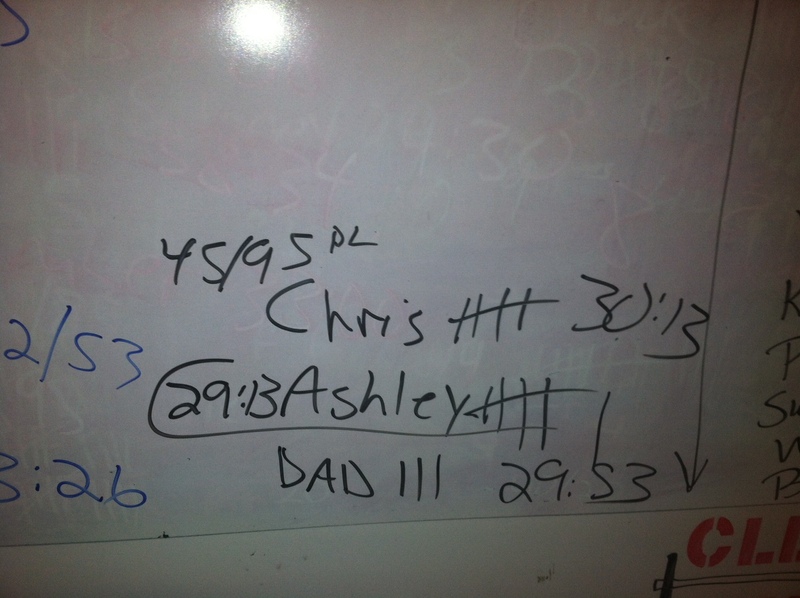 As far as competing with Ashley…….now you know why I started the workout a few minutes behind you two. : ) You can also look forward to getting humbled working out with Beth Dessner. Happens to me all the time. I look forward to seeing you at our next CrossFit session. Thanks, Tim. And I don’t care what anyone else says, I like your taste in music. Thanks, Doug. It would be comforting to know you’re in the house when I’m there. But they haven’t killed me yet, so maybe I’ll be OK.